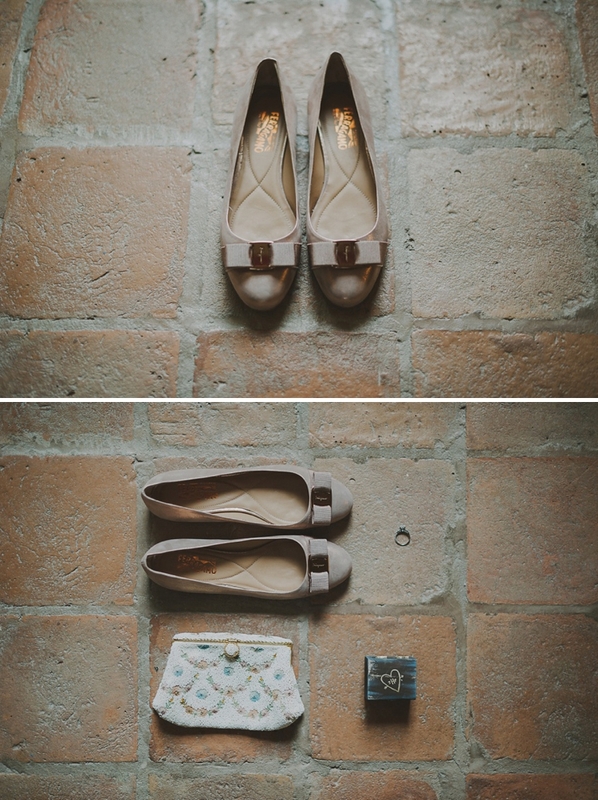 Today we are heading to the region of Piedmont in Italy for a sunshine-soaked destination Jewish wedding. Piedmont is not only breathtakingly beautiful, it’s also a gastronomic gem and famous for its wine production. It was therefore the perfect location for the wedding of self-proclaimed foodie couple, Jacqueline and Florian, who live in New York City. 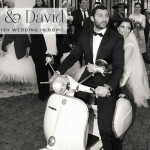 Theirs is a wedding of pure elegance, creativity and authentic Italian touches. 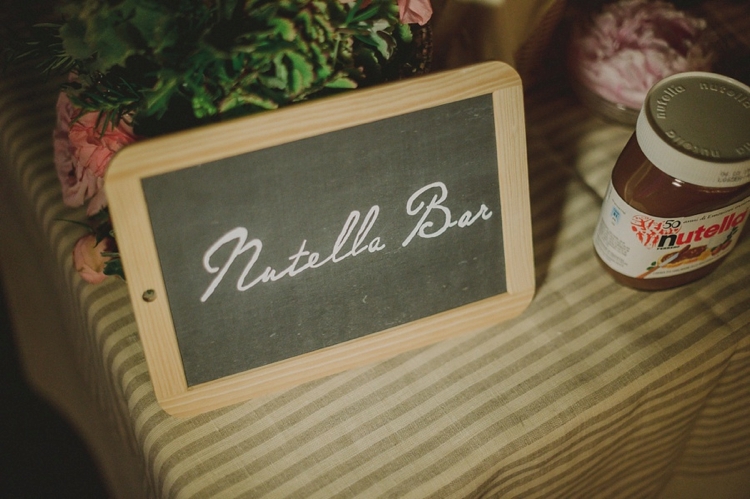 Those touches range from a team of local Piedmont Flag Throwers greeting them at their recessional, to having an actual Nutella bar at the party! Yes, Piedmont is the birthplace of Nutella — the region is full of hazelnut fields and as a tribute to this, there was an actual Nutella bar (I die), and additionally a local bakery made the region’s famous Torta alle nocciole e brindisi con — essentially a hazelnut-filled wedding cake. 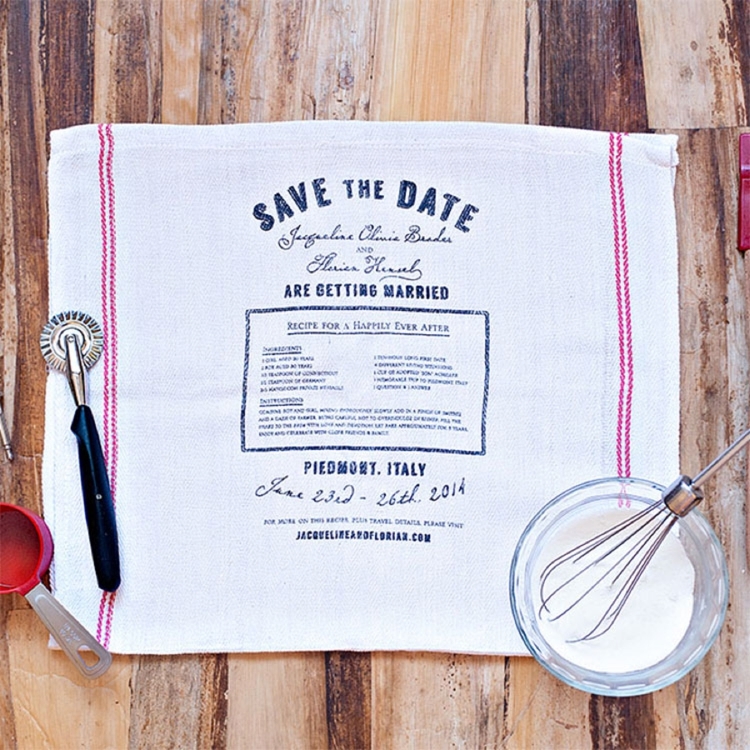 I adore the “Recipe for Love” screen printed tea towel save-the-date too — such a great idea for a foodie couple. 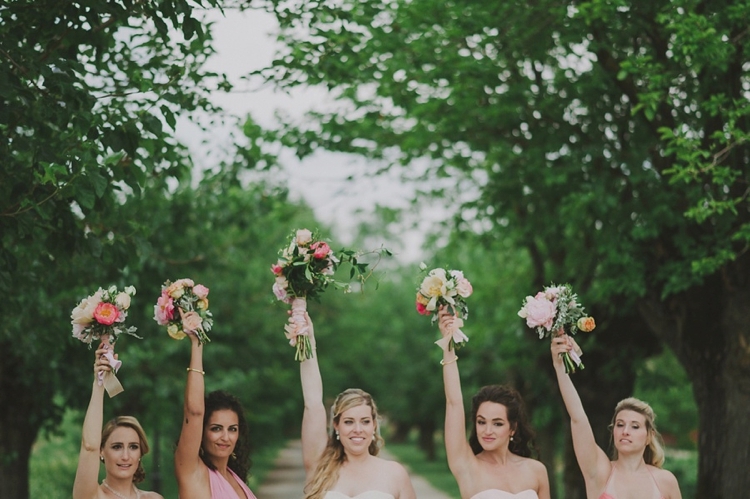 And I haven’t even begun to tell you about the florals (you need to see the bouquets! 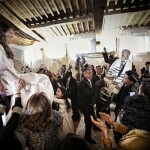 ), or the fact that these two were actually married by Italy’s first female rabbi, Barbara Aiello. I think what Jacqueline and Florian teach us is that even if you get married abroad, it can still be a really personal affair, filled with the most important things to you — in their case, that’s family, friends, fantastic food and wine, great music, and an appreciation and respect for a variety of bridged cultures and traditions. 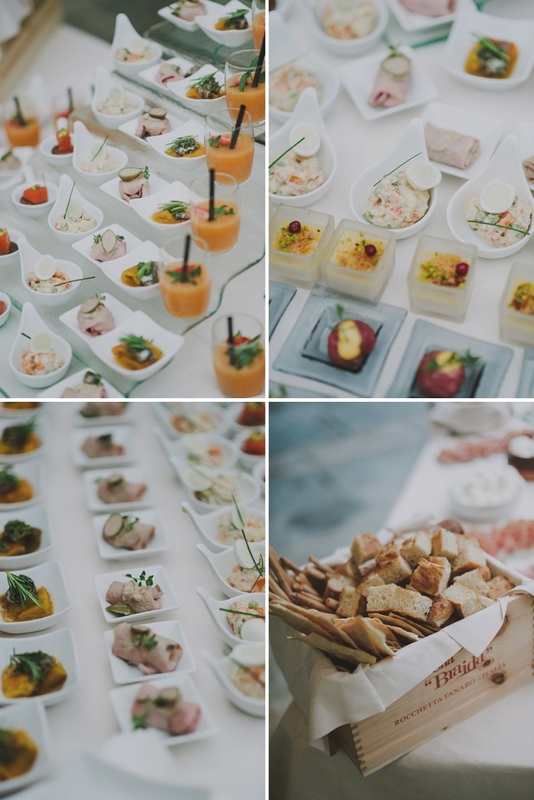 The whole affair was planned lovingly and meticulously by our much loved Smashing Suppliers, Valentina and Ernesto Troncarelli from the Italian Wedding Company. Jacqueline has so much love for them, and rightly so. 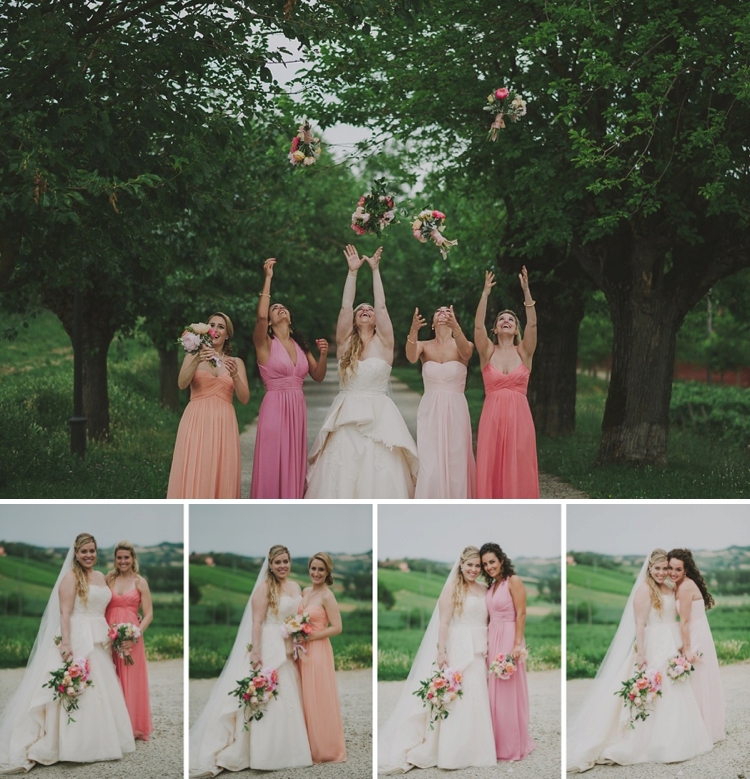 Without further ado, I’ll let the beautiful bride transport you to Italy with her detailed report, alongside Gianluca and Mary Adovasio‘s beautiful photography and Riccardo Lavezzo‘s film. Jacqueline, the Bride: Florian and I met on Match.com. Our first date lasted 10 hours! We met for brunch, then walked around NYC, went to three different ice skating rinks and ended the date with sushi dinner near my apartment. Florian and I live in New York City, close to the rest of my family who are spread throughout the Tri-State area. Florian is German and grew up on a dairy farm that has been run by his family over multiple generations. His parents still operate the farm, which is about an hour outside of Frankfurt, so we knew traveling for an extended period of time for a wedding (especially as far as the US) would be nearly impossible for them. At the same time, we knew we didn’t want a large blingy-factory wedding that has unfortunately become quite the norm in NYC. 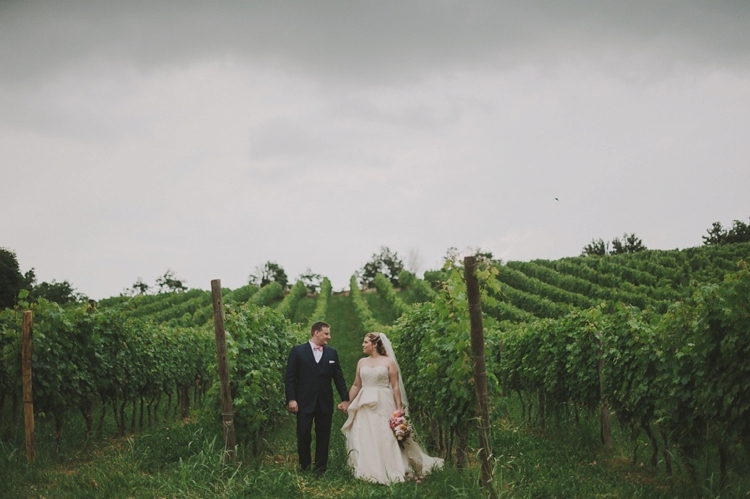 Florian proposed a few years ago during our stay in Piedmont, Italy overlooking a rolling landscape of wine vineyards with the massive Alps in the background. As big foodies (I run Marketing & Communications for a Restaurant Group, Florian grew up cooking old German recipes from his ancestors) we fell in love with the region, which food and wine publications have heralded as “The Place Where Chefs Go to Vacation”. Piedmont is home of the Slow Food Movement, Eataly, the University of Gastronomic Sciences, the Banco del Vino (bank of wine), Nutella, is the largest white truffle region in the world, and houses some of the most incredible Italian wines such as Barolo, Barbera, and Barbaresco. It’s also quiet, low-key, and has managed to protect and maintain the authenticity of its local culture and heritage — an anomaly in a country so attune to tourism. 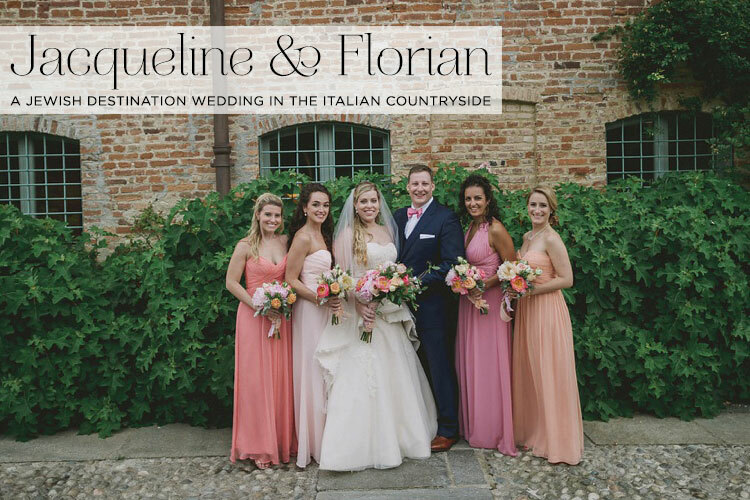 We operated with the mindset of hosting a more authentic Italian wedding versus an American wedding in Italy, celebrating both the local culture as well as our own journey as a couple. 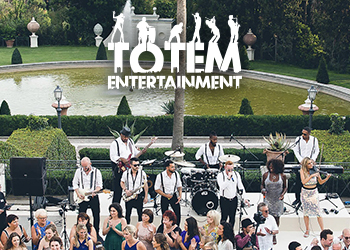 We were able to orchestrate quite an affair over a few days time, thanks to our incredible wedding planners, Valentina and Ernesto from the Italian Wedding Company, and their unbelievable portfolio of vendors. The day before the wedding, we hosted an off-site tour of the region, including a wine tasting at Locanda del Pilone, overlooking the hill where Florian had proposed a few years earlier, followed by a cooking class hosted by Chefs at The University of Gastronomic Sciences and a tour/wine games at the famous Banco del Vino. Working with Valentina and Ernesto was key in helping us bridge two different families together in a completely new and different setting. 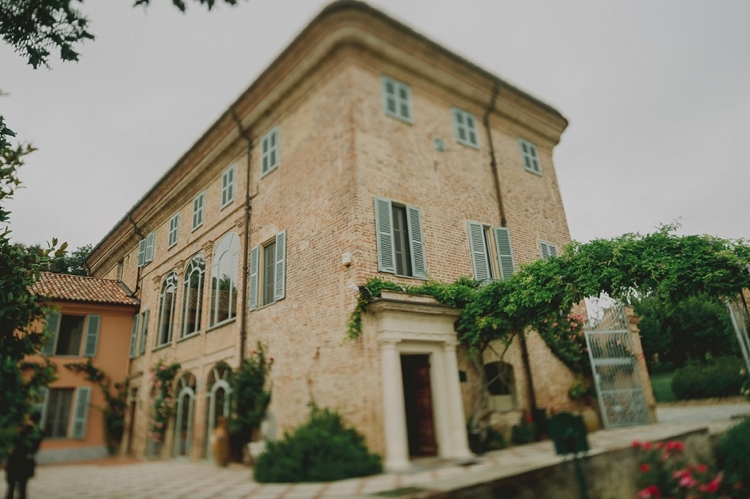 Through their guidance, we realised that by having guests stay at the same location where we would host the ceremony and reception, we could provide a truly elegant and unique setting coupled with a sense of relaxed familiarity. Our venue, Relais Sant’Uffizio Wellness and Spa in Asti, Italy was originally a monastery built in 1542 by Pope Paul III and has now regained its old glory thanks to a very careful renovation (completed in 2012), restoring the nineteenth century frescos, the Virgin Mary icons and the old chambers of the monks of the convent. The grounds include English rose gardens, tree-lined parks, a lemon garden, vineyard, tennis court, indoor and outdoor pools, and state-of-the art spa. 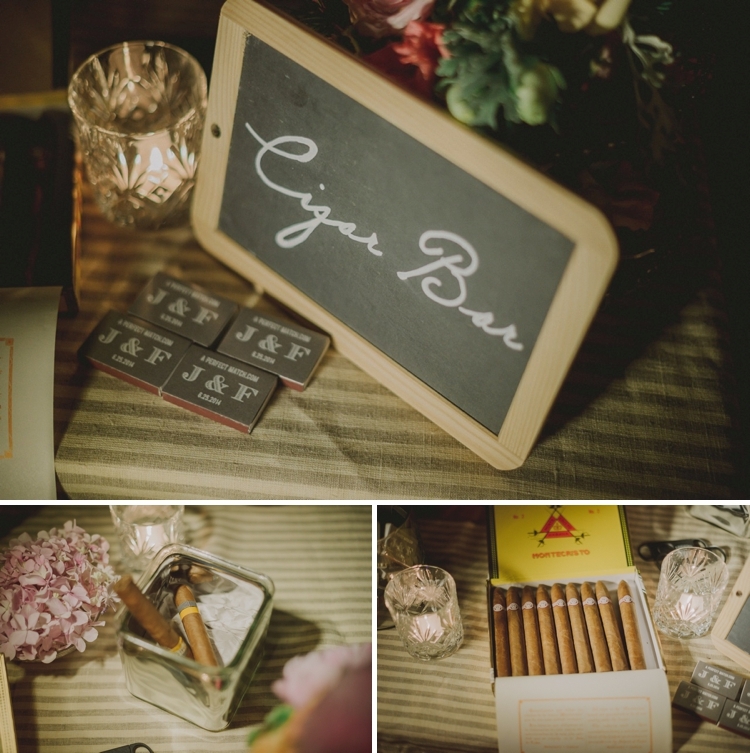 It left little need for much else in terms of dà©cor or entertainment, and easily aligned itself with our vision of an Old World, rustic-elegant countryside wedding. 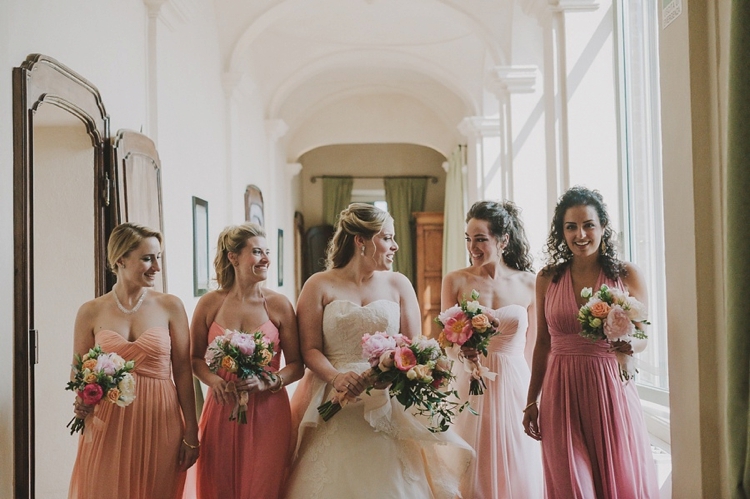 We stuck to a colour palette that complimented the rich architecture and historic feel of the monastery — soft shades of blush, coral, peach, and rose with hints of grey. In terms of bridesmaids dresses, I loved the mix & match look, which I had seen executed so well by a former friend, and wanted to allow my bridesmaids to choose dresses that they felt suited their personal figures and style. Our floral arrangements consisted of large peonies and English roses matching the same colours of the bridesmaids dresses. Our Save the Date was really special. Becca Goldberg from Suite Paperie and I designed tea towels displaying a “recipe for a happily ever after,” which included bits and pieces about our 5+yr relationship and kept in line with the food & wine focus of our entire wedding week. a beautiful Ines Di Santo dress with a detachable cascading peplum skirt. As a marketing & communications professional, I definitely did my fair share of market research before going to try dresses. I don’t think there was a white dress online I hadn’t seen by the time I went to try on “the one”! And, by the way, “the one” happened to be the very first dress I tried on! I purchased a gorgeous two-in-one Ines Di Santo dress featuring a fit and flare gown with a detachable cascading peplum skirt. I had the dress custom designed from an original mermaid fit to align more with my curvy body type. The peplum gave it that dramatic edge for the ceremony and then I took it off for the dinner and reception so that I had more room to dance and move around. The veil was from Bridal Reflections, where I purchased my dress. My earrings were heirloom pearl and diamonds borrowed from my mother. I wore a simple gold cartier bracelet that I’ve worn since the day I was born and a gold Tiffany’s bracelet with an eternity band that my husband surprised me with the morning of the wedding. Lastly, I had an old beaded clutch passed down to my from my grandmother. I wanted to keep things simply and elegant. 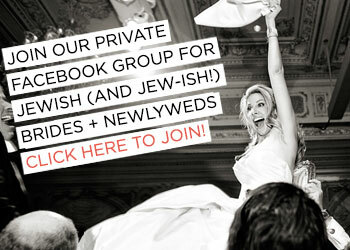 I think one of the biggest mistakes brides make is over-accessorizing. I wanted to keep a light and ethereal look but also pay homage to my family ties and those who have raised me. I wore FLATS! 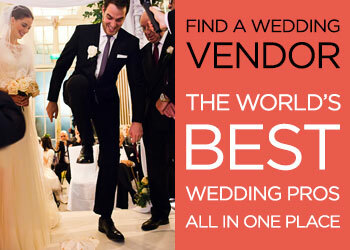 I know, I know, total faux-pas to many brides-to-be. We were married on a grassy hill, had cocktails on a cobblestone pathway, and danced on wooden floors. The last thing I wanted to worry about was toppling over or aching feet. Plus, at 5’8, I don’t need the extra height. I’m obsessed with Salvatore Ferragamo flats. I think they’re incredibly well-made, unbelievably comfortable, and I found them in a shiny rose gold colour to match everything! Patrizia Pinna was suggested by our planners. 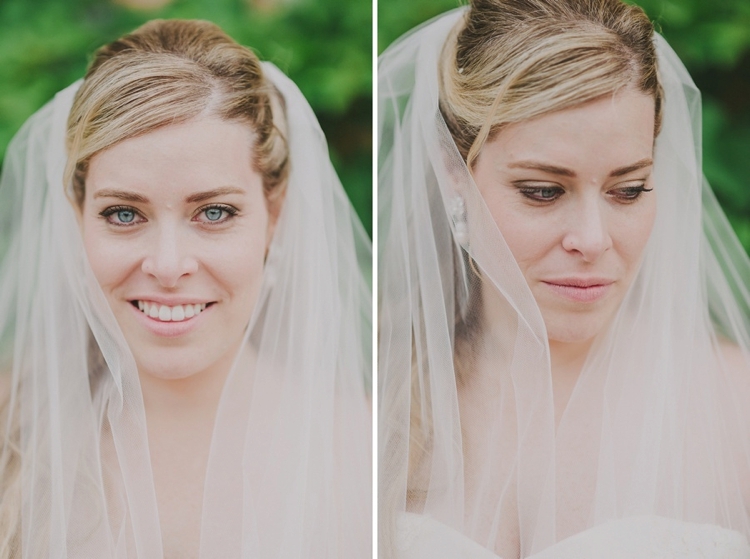 I opted for a natural but chic style matching the veil I wore. 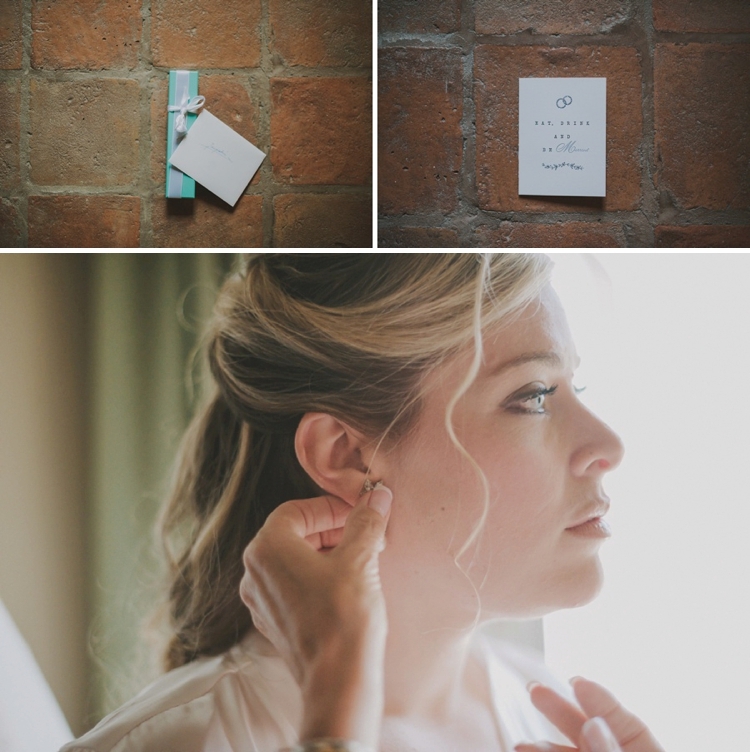 I had them do a trial the day before the wedding, and they were wonderful and spent as much time as I needed to ensure I had the look I wanted the next day! Florian wore a custom three-piece suit from My Suit NY. He also wore a pair of horse bit Hermà¨s cufflinks gifted to him by my grandfather. I’m a former equestrian so the gesture combined with the horse-related theme filled my heart. I also gave him an H embroidered Hermà¨s handkerchief, the morning of the wedding, to follow my grandfather’s lead and also pay tribute to my becoming a “Hensel”. His Kippah was from DesignKippah on Etsy. Three of my best friends were my bridesmaids and my sister was my maid of honour. In terms of bridesmaids dresses, I loved the mix & match look, which I had seen executed so well by a former friend, and wanted to allow my bridesmaids to choose dresses that they felt suited their personal figures and style. We worked with our brilliant florist Stefania who actually sketched the entire design by hand after a brainstorming session. She created it in the garden of Relais Sant’Uffizio with tall bamboos and smooth fabric. She then added our theme flowers and colours to enrich it in a wonderful way. 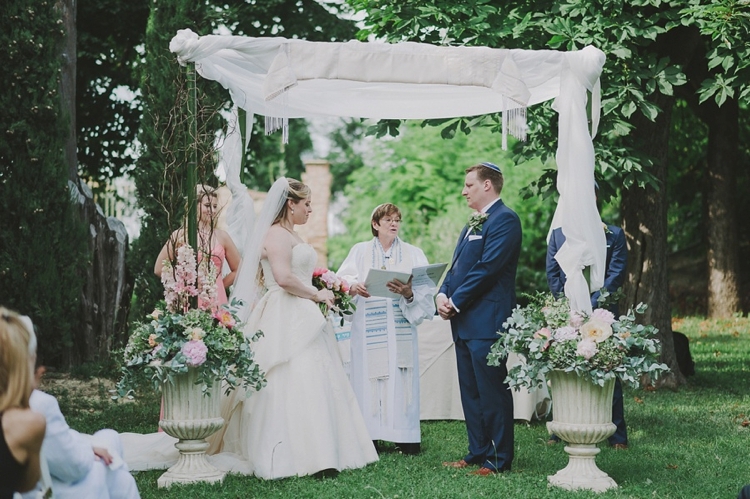 We planned an outdoor Jewish ceremony officiated by the first female Rabbi in Italy, Rabbi Barbara Aiello, under a custom-designed chuppah decorated by our incredible florist, Stefania. The ceremony followed Jewish traditions but we also included some Italian Jewish customs that Rabbi Barbara explained to us and the audience. When Florian and I exited the ceremony, his relatives surprised us with a German tradition/wedding game of cutting through a big heart with our names on it, which we still have as a keepsake. Flag Throwers and a tradition that involved sawing a log in half! Later in the evening, we were surprised with another German custom called Baumstamm Sà¤gen, where the couple works together to saw a log in half, symbolising their willingness and ability to master the difficulties that inevitably arise in a marriage. 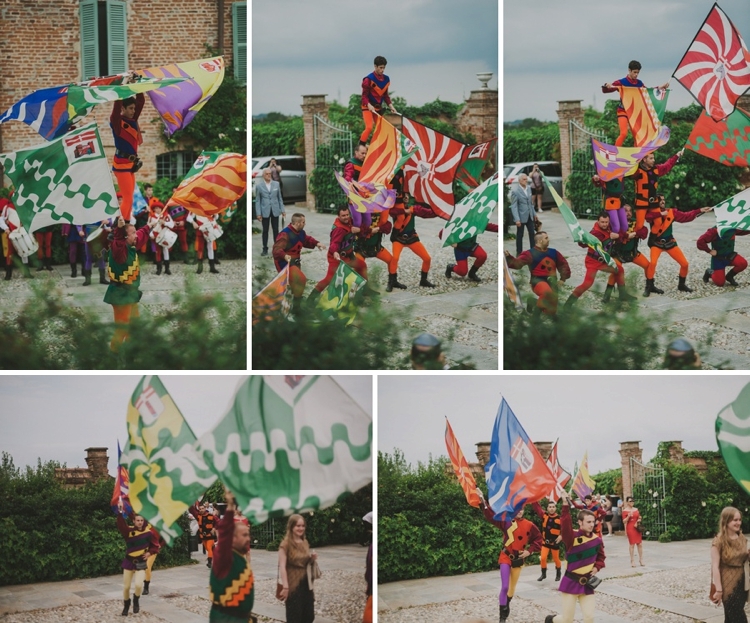 We equally celebrated the traditions of the local town when I surprised Florian and our guests following our procession from the ceremony, with the Palio degli Sbandieratori or flag throwers of Asti, who demonstrated the ancient art of precision flag throwing and gymnastics. 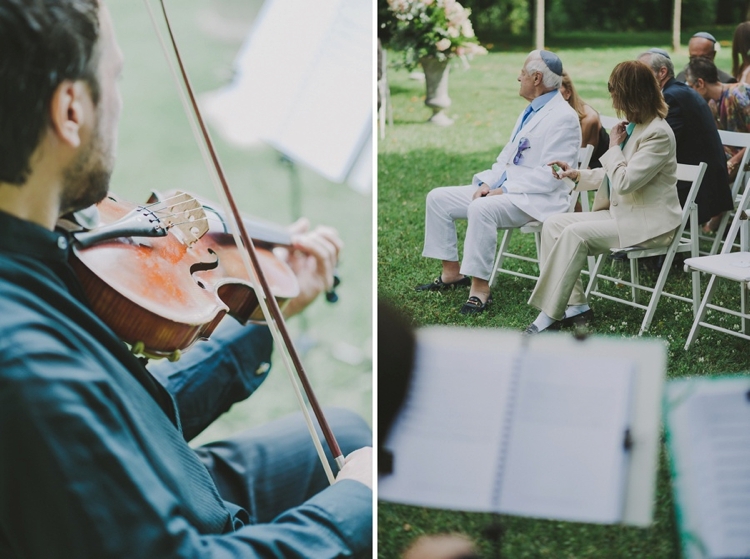 We had a wonderful string quartet playing for our ceremony and reception called Gli Archimisti. My mother, a former Opera singer, has performed with some of the biggest companies in the world. Needless to say, music has been a huge part of my upbringing and something which is deeply important to me. Gli Archimisti was the perfect solution and I still consider myself truly lucky to have worked with them. They learned new music just for my wedding, played brilliantly, and were the epitome of professionalism. For my processional they played a romantic version of A Thousand Years. 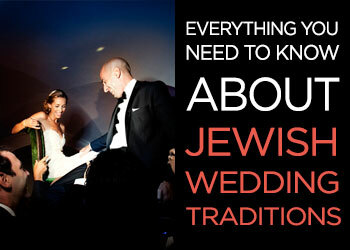 During the signature moments they played Yedid Nefesh and for our recessional they played Heivenu Shalom Aleichem. During the reception they played lovely classical music and some movies soundtracks. They also played a wonderful version of Viva La Vida as special gift for me and Florian. I’ve already mentioned my florist few times here. This is the right time to give her the right space. 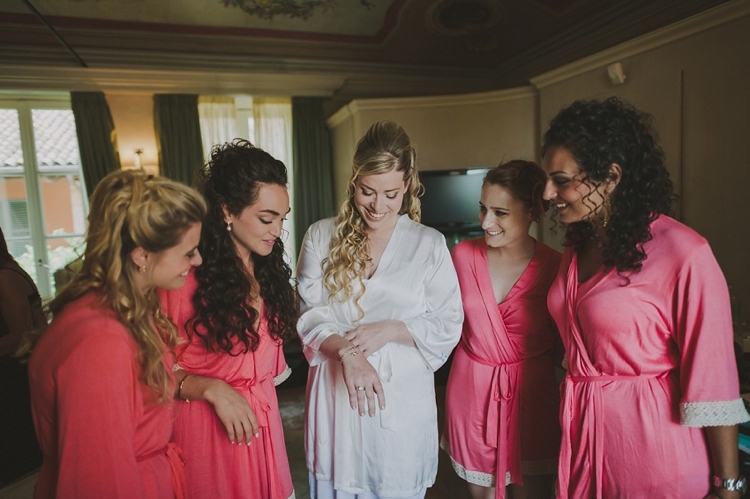 Her name is Stefania Gulli and she runs Stefania Weddings & Special Occasions. 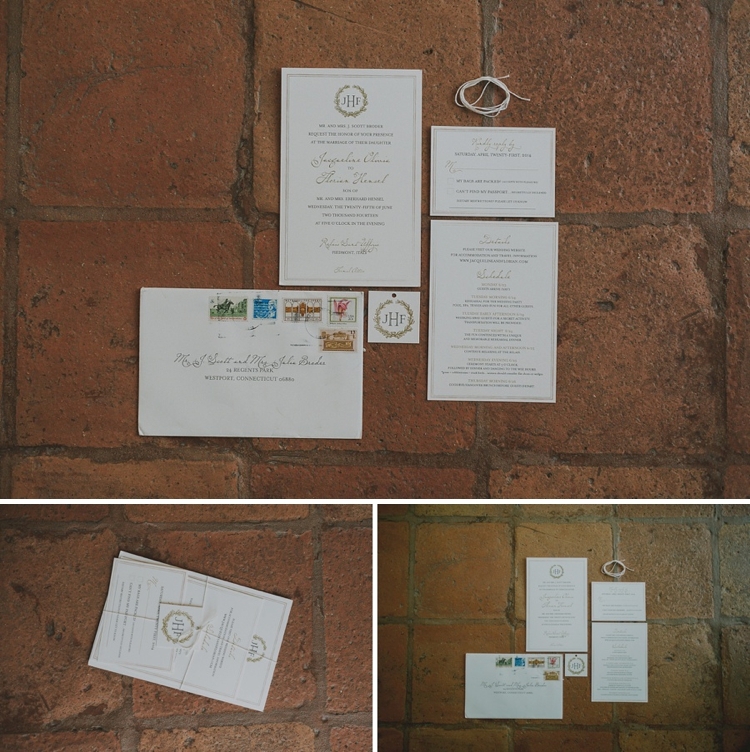 Stefania and I worked together to put my vision into paper and then make it a reality. Quite simply, Stefania is an artist. 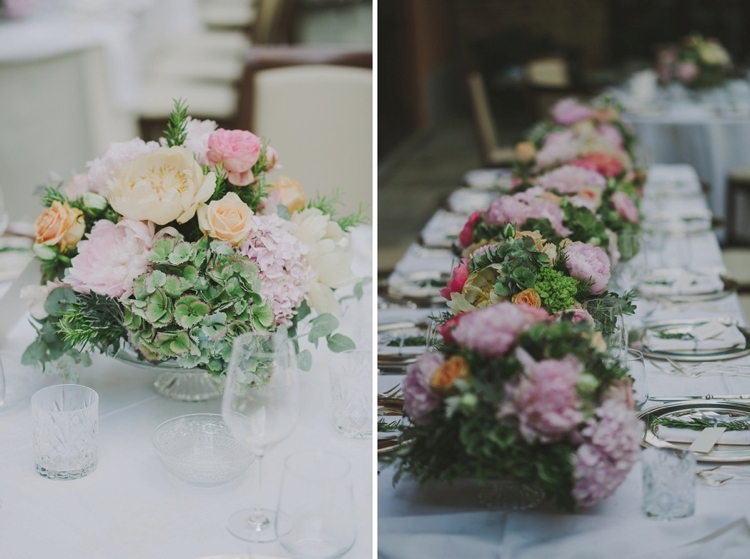 For the reception she used the fresh, voluptuous peonies that lined the tables in custom glass bowls and cake stands, twinkling tea lights falling from a bed of ivy and wisteria above the dinner dance floor. 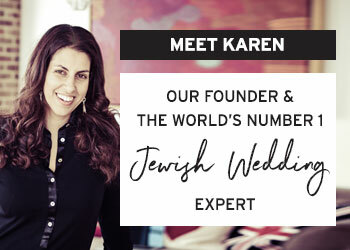 For our ceremony she used statuesque stone vases filled with branches and intertwined flowers that held up our chuppah, I simply could not have imagined a better floral designer for my wedding. 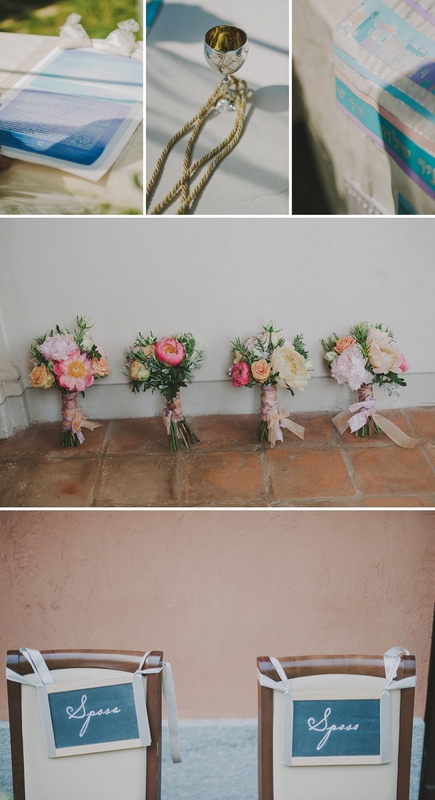 Stefania used English roses, peonies and greenery for my bouquet and my bridesmaids bouquets too. 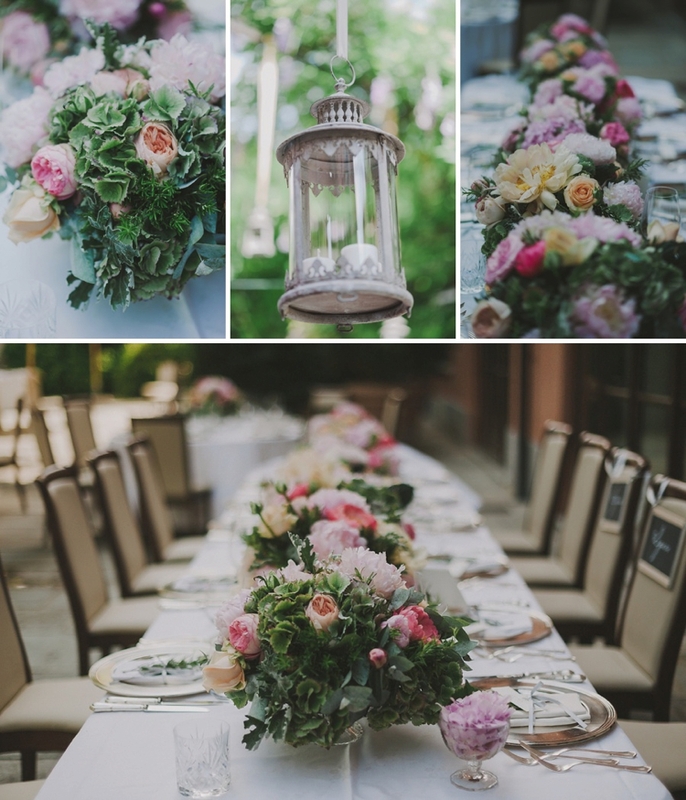 Guests dined under a pergola draped with purple wisteria and hanging lanterns over a meal featuring traditional Piedmontese dishes like pasta with zucchini flowers and black truffle and umbrian fish with candied lemon sauce. For our wedding cake, we had a local bakery make the regions famous Torta alle nocciole e brindisi con or Hazelnut cake. Piedmont is full of hazelnut fields and is the birthplace of Nutella! 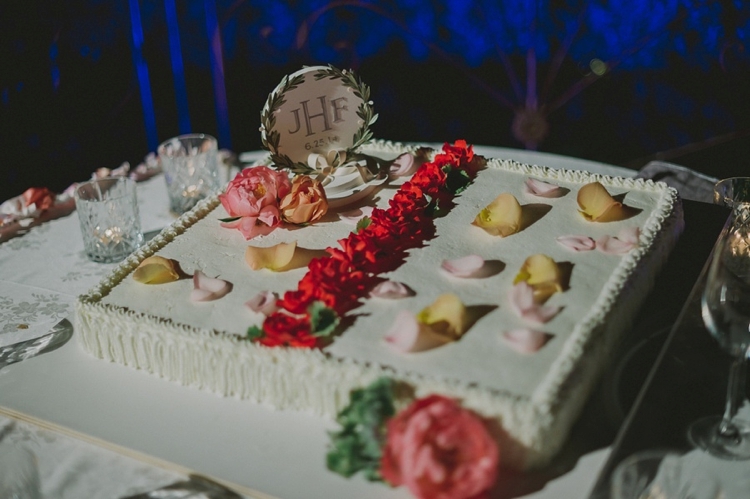 Our wedding planner had a local bakery make the cake — it was by far one of the most memorable food items from the entire wedding week. We didn’t have a single piece left! I also worked with Concarta to design a custom cake topper featuring the monogram from our wedding invitations, wrapped in a floral wreath, reminiscent of our floral arrangements and colour scheme. The cutting of the wedding cake was very emotional. We cut our cake in a separate garden of the Relais under an ancient wrought iron canopy. We hung a sparkling garland on it with “Best Day Ever” written on it and we really meant it! All our guests held a sparker to light as we cut the cake. 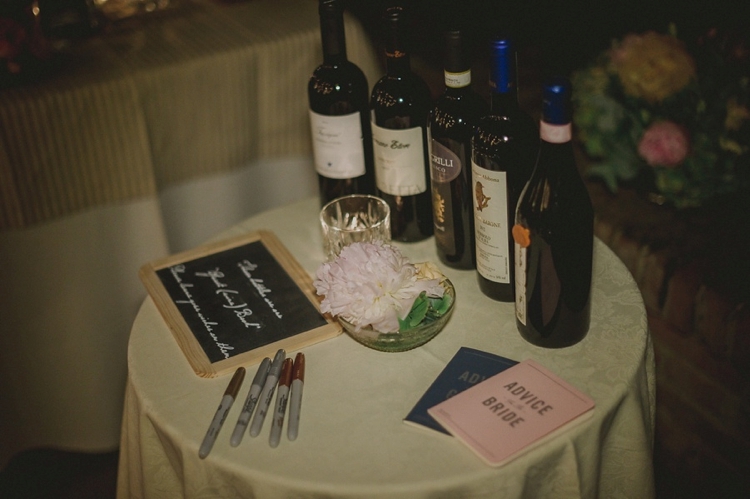 Guests also enjoyed a Nutella dessert bar, Cigar bar, and for our “Guest Book” we had guests sign five different vintages of wine, to be opened on our 1, 5, 10, 15, and 20 year anniversary’s. Our DJ, Paolo Petrillo, played us an amazing playlist that really made the party! 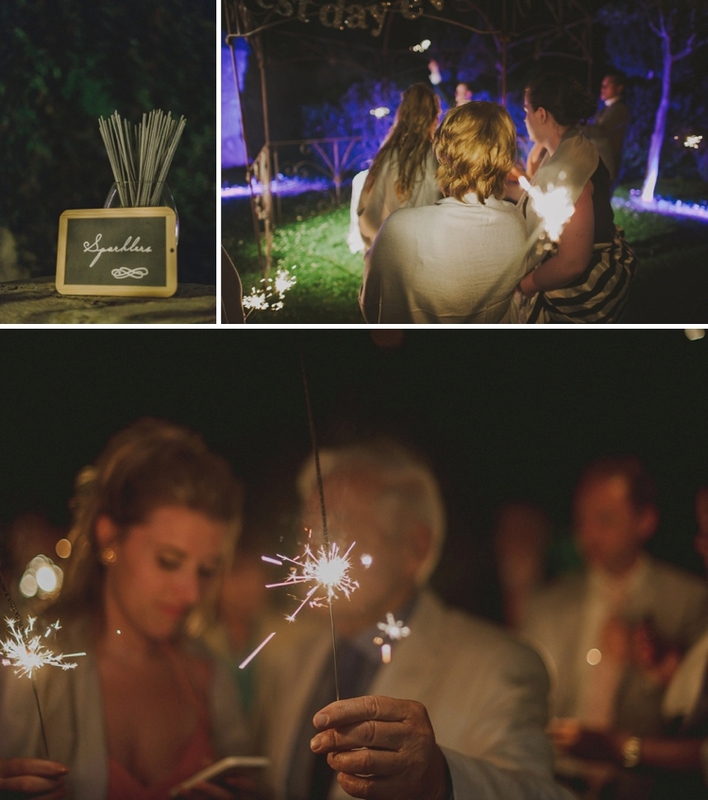 He also coordinated our lighting design enhancing the beauty of the natural setting of Relais Sant Uffizio with romantic fairy lights under the wisteria pergola and some dancing lights for the party. We decided on something local for our wedding favours with a jar of Monferrato (very local) organic honey with a little wooden honey spoon etched with “Life is Sweet”. They were really cute. We also pampered our guests with customised welcome bags when they checked in to the hotel. Inside there were Piedmont traditional biscuits – Baci di Dama -, an itinerary for the day, sweets, water, a pre-stamped local post card, and a little bag of rice to throw after the ceremony. 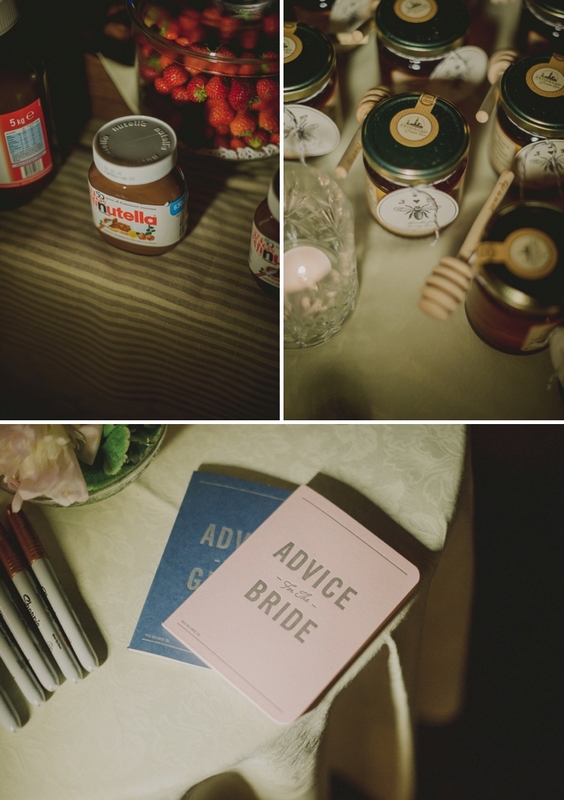 I had very clear ideas of the type of photographer I wanted even before booking our wedding reception venue. 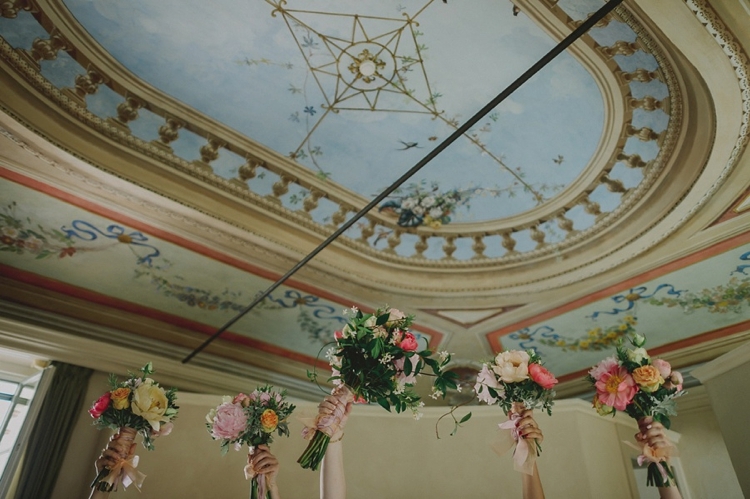 I’d discussed it with our planners during our first wedding planning visit in Italy and I had no doubt it was going to be Gianluca and Mary Adovasio. 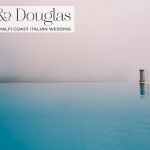 They are amongst the best Italian wedding photographers, and aside from being great professionals they are two wonderful people! They are kind, friendly and weren’t at all intrusive. We also had a very talented videographer: Riccardo Lavezzo and his team. We fell in love with his style as soon as we met him, and looking at his video is like watching a real movie! He shot a wonderful video for our day and he provided us with a trailer that really seemed like a music video rather than a wedding video. We were thrilled by the idea of having a “drone” camera over our heads for air footage. Florian and and his men were all excited to see it… as were all our other guests too!